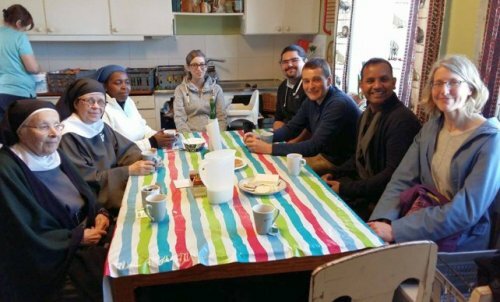 In the second half of April, two of the long-term volunteers in Taizé, Richard from Bangladesh and Merric from Australia, travelled throughout Sweden. Here is the story of their journey. From the 18th of April we began a two week visit to Sweden to visit churches, schools and share in prayer together with the youth of this beautiful and diverse country. Not knowing what to expect, we arrived in Stockholm to a warm welcome and the first of what would be many welcoming prayers and joyful meetings. Meeting the youth of Sweden was both an inspiring and wonderful experience and we found ourselves inspired by their enthusiasm, their faith and also their willingness to listen to what we had to share with them and to share with us. 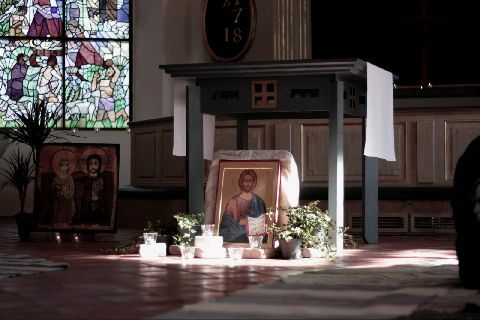 The young of each parish made us welcome by filling the churches with candles and beautiful decoration and sharing the music, silence and prayer with us. After each prayer we partook in the wonderful Swedish tradition of cake, coffee and discussion, known in Sweden as “fika”. Throughout the journey we discovered a common task that all of Europe faces; how to welcome arriving migrants and refugees. Those in need have come to Sweden and within each place we visited we witnessed both this need and the response of the Swedes. We visited a monastery in Alsike, where a community of sisters is housing people in need and providing for their needs. The sisters provide what they can and share what little they have. It was inspiring to witness the assistance that local Church communities across Sweden are providing to these people in their plight, so that they may feel both understood and loved after a perilous journey in the hope of a better life. It made us ask ourselves the question, how do we welcome the other? Like the Good Samaritan, do we witness to Christ and mercy, helping those in need and making them feel welcome, or do we walk blindly by? To witness young people taking steps to grow in their faith and share moments of prayer, silence and discussion with us and the warm welcome we received was heart warming. It gave us many moments of joy and inspiration, praying together in unity and continuing our faith journey in the hope and trust of the love of Christ. 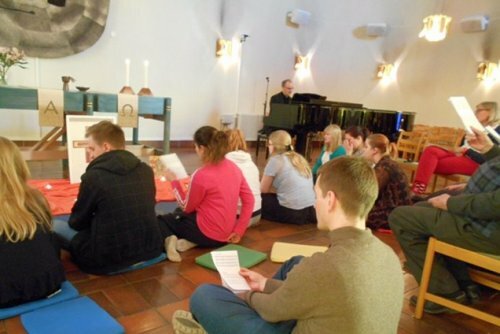 Two young volunteers from Taizé recently returned from a visit to several parishes in Sweden. Here is an account of their journey. Young people everywhere have so much energy, so much initiative and so much spirit! For them and for us it was a real gift to see how, when they dared to follow their initiatives, dared to listen to the desire to meet with others, to share about life, about faith, about beauty, about difficulties, to pray together, to be silent together, to search together, that when they dared to follow this desire, something unexpected, something beautiful appeared and grew in their lives. The theme of the meeting was the words of Jesus: “Where two or three are gathered in my name, I am there among them”. We know that for all the participants of the meeting and all the people involved there were moments when these words became almost visible, almost tangible. 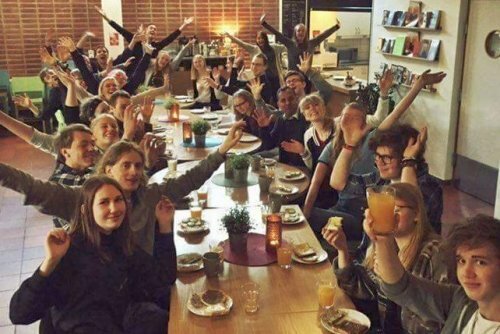 To meet together, to have the courage to be yourself, to express your faith is a great struggle for young people in Sweden, even in the churches! How can the church be a place where people can search for and find Christ, where they can gather around him in trust and love? This is a question that concerns all Christian churches throughout the world, but it is a question that was in our hearts in many different ways during our stay in Sweden. We were deeply touched by the meetings with different groups of people who gather in cities and countryside to pray together, to sing and to share about their faith and all that follows from there. They have open hearts and inner peace, which makes it possible to recognize the presence of Christ who is always there. Many of them are working with sick people, handicapped or mental disabled, Christians and non believers, and every day they are giving theirs lives for others. Those people are for us visible signs of reconciliation, love and hope for the future. For the both of us this trip was an encouragement to continue our own ways with Christ.